Once your indoor seeds have germinated, it’s time to care for those little seedlings to ensure they grow into healthy, thriving plants. These tips show what you need to do. Seed packets and catalogues often tell us how many weeks before last frost you should start the seeds indoors. To streamline the process, with my indoor seed starting schedule, we group seeds with similar timing, so new batches can be started every two weeks or so, instead of daily or weekly. Once you have started seeds and have them under grow lights (you can see the type of lights I use and recommended supplies here), your task is to check on things daily. After the first few days, it can be easy to forget. If you think this might happen, set a reminder in your phone. The one big problem that can happen at this stage is allowing the seed starting mix to dry out. If your seeds dry out, they will die. So be vigilant. 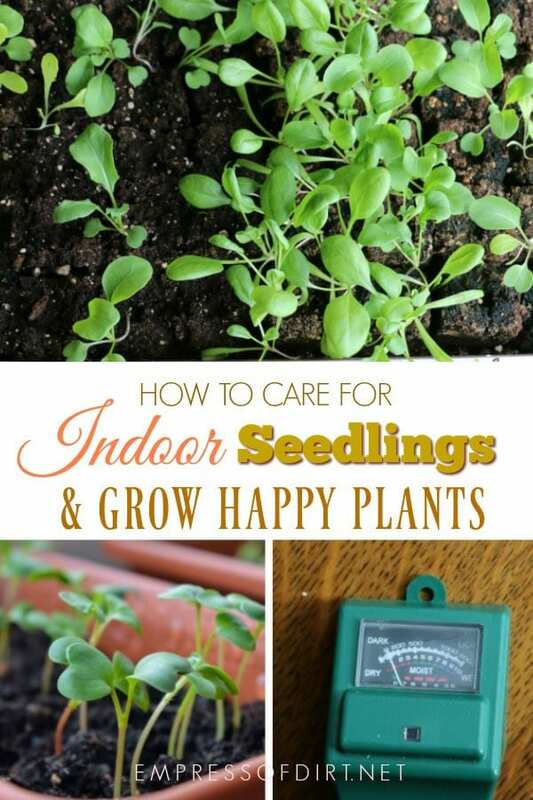 Check your seeds/seedlings/babies every day. Nice, even moisture (not too little, not too much) is critical, especially during these early days while the seeds are preparing to germinate. Some seeds germinate within days, others take days or weeks (or even months). Your seed packets will tell you what to expect. But don’t slack off: things can change quickly. This is a good time to get familiar with the right way to water plants. Learn what a moderately-watered growing medium or soil looks and feels like. You should be able to tell with the tip of your finger whether water is needed (if your eyes have not already told you so). Always water the bottoms, aiming the spout of the watering can into the base of the soil blocks, or onto the surface if you are using pots. Do not pour water on the seedlings themselves. Use warm water to avoid shocking the seeds or plants. Before seeds have germinated, it’s also fine to use a plant mister with warm water to moisten them. We want the lights to remain approximately 2 to 3-inches above the tops of the plants (or growing medium, if there is no growth yet), throughout the growing process. As your plants grow, they will become different heights. To accommodate this and maintain the right distance from the grow lights, as things grow, I group plants by height and put similar ones together in smaller trays. Trays of shorter seedlings are propped up with pieces of 2×4 wood scraps underneath the trays. If your seedlings appear leggy (too thin and spindly), that’s another sign the lights are too far away. 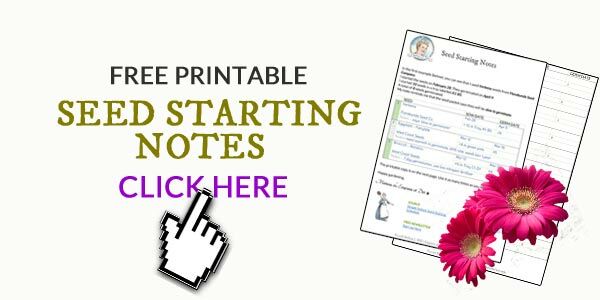 Jot down notes. They are helpful throughout the growing stages and for reference next time. The seed packets tell us when germination should happen. Did your seeds sprout at the expected time? Note the date and number of days it took. Of all the seeds started, how many germinated? How did this compare to the germination rates listed on the packet? What’s working? What isn’t? Anything you want to try next time or do differently? Write reminders for yourself. During the initial growth stage, the new seedling will have its first leaves, called cotyledons, which are embryonic leaves. These may appear fairy round, or like tiny blades of grass, depending on the type of seed. At this point, your seedling is still in its early infancy. The next leaves, the “true leaves”, are different in appearance. As you get familiar with the plants you grow, you’ll start noticing that these first true leaves look like tiny versions of the mature plant’s leaves. And that’s because they are! It’s quite exciting as a gardener when you can start identifying plants simply by their first true leaves. It’s like recognizing a friend from their baby picture. Take photos or sketch them. Keen observation is key to becoming a good gardener. In addition to maintaining a good distance between the grow lights and the tops of the seedlings, you should also rotate your trays or pots, so the seedlings do not lean. Watch for this when they are one inch tall onward. New gardeners are often too eager to find shortcuts and fast-tracks. Hold off on the fertilizer. Germinating seeds are self-sufficient. Everything they need to grow is contained within the seed. Once they have sprouted, they start relying on their environment for sustenance. Their early needs are warmth, water, good air circulation, and light. Once your plants are several inches tall, you can start fertilizing them, unless there are other recommendations on the seed packet. Because the plants are small and young, it’s important to go easy. Read the instructions and recommended dose on the product label and cut it in half. I do not specifically recommend these brands (I have not tried them) so check on them before purchasing. 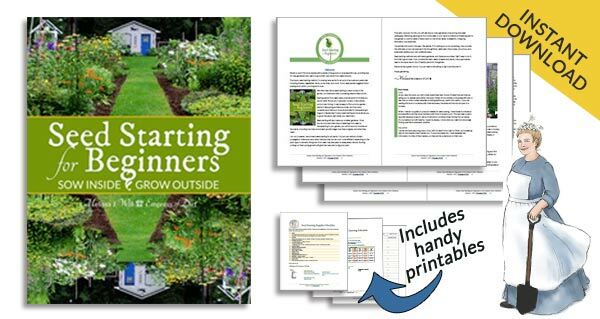 With faster-growing plants, the timing will be right to start your seeds in soil blocks, and, a few weeks later, acclimatize the seedlings to life outdoors over a two-week period, and then plant them outdoors. The slower-growing and larger plants will probably require transplanting into larger containers indoors before it’s outdoor planting time. 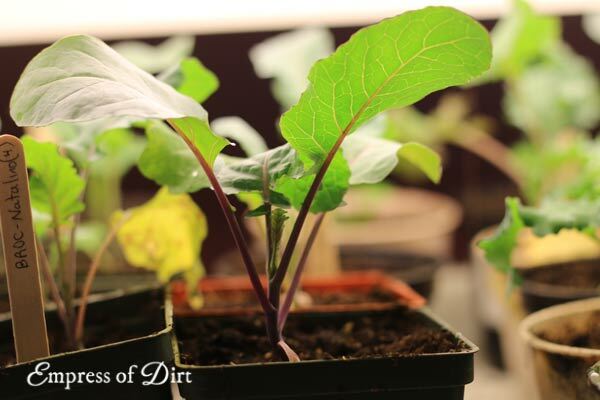 I do this with the soil block plants when I can see that the roots are running out of room within the block. If you have started your seeds in 3-inch pots, you’ve bought yourself more time. The seedlings may do fine just as they are. Avid growers may need another pot size larger at some point. As seedlings are moved to larger pots, I start running more lights on additional shelves to accommodate them. Again, group your plants by height so it’s easier to maintain the right distance from the lights. If you notice any of the plants are weak or sickly looking, remove them. And remove their soil blocks or growing medium as well. Some seeds produce weaker plants, and, while they will grow, they will probably never really perform properly. There are also insects, mold, algae, and fungi including ‘damping-off’ that can appear when conditions are too moist. It’s better to start something else in its place (with clean trays and pots) that will provide the flowers or fruit you want. Unlike other seed starting methods, I recommend sowing a single seed in each soil block instead of sowing several seeds and thinning them out later. I do this with confidence because I check that my seeds are viable ahead of time, so I know they are very likely to germinate. If the seed packet indicates a natural, low germination rate, I will sow 2-3 in a block. 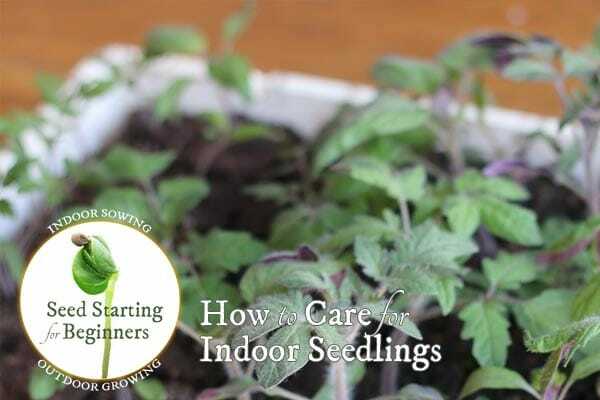 If you have several seedlings growing close together, it’s thinning out time. If both look healthy, you can transplant one to another block or pot. When handling seedlings, never touch the stem or roots, Handle gently by the leaves only. You can use tweezers if you are thick-fingered. Just don’t squeeze too hard. You don’t want to crush the leaves. It’s delicate work! I’m terrible at thinning seedlings, which is another reason I avoid it. As our last frost date approaches, it’s time to start preparing the young plants for life outdoors.